I suppose if I was to be pressed what is my favourite meal of the less pretentious variety, outside of a full English breakfast, I would say fish and chips with all the trimmings. Having lived in Southend for the majority of my life, I reckon I have sampled a good many of the establishments that sell fish and chips, and usually for me it comes as a “take away”. While these differ as do all restaurants, it is one of those dishes that is hard to get wrong, although things like the freshness of the fish does play a big part, and as a fish and chip connoisseur I reckon I could come up with a clear cut pecking order if someone wanted to commission me to do so. 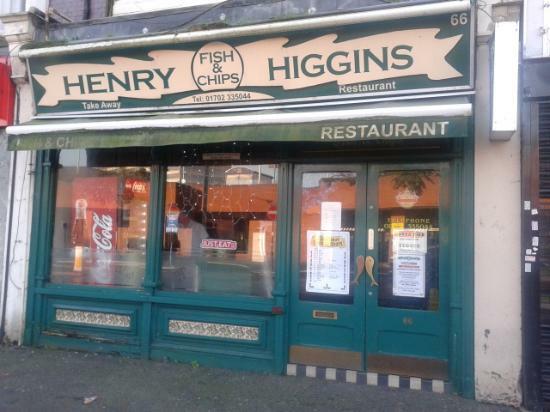 A couple of months ago, I ate fish and chips from Henry Higgins fish bar, opposite Sainsburys in the town, for the first time. While I don’t like waiting as a rule for my pensioner special take away, in fairness it wasn’t for long. The service was good, the price was on the less expensive side and the fish on that occasion really did taste like it had jumped out of the sea, and it made an enjoyable meal, making the waiting all the more worthwhile. It certainly gained my “I will return to it again” award. I noticed it had a sit down facility and it seemed that it was fairly well patronized, largely with OAPs. The occasion was during the week when I made an unscheduled visit to town around midday. It was in order to get some replacement car tyres. I was told there would be a 45 minute wait and the penny dropped: given I was peckish, why not spend it at Henry Higgins, less than two minute walk away, but this time to eat in? And I wasn’t disappointed. The service was cheerful and helpful and it was a nice atmosphere and surroundings. £6.95 for a good size portion plus mushy peas, plus salad, plus bread and butter, tea represented excellent value. The meal was tasty. But for the fact the fish didn’t taste super fresh I would have given it 10 out of 10 rather than 9. Henry Higgins has been definitely marked down for a future visit for one of my around lunch time meetings.